Who is Honored on Sukkot? Last week, I spent some time writing about those things that make Jewish people unique and distinct from the people of all the other nations, including Gentile Christians, in three blog posts: Upon Reading a Rant About “Messianic Jewishism”, Diminishing the Moon and Israel, and Are Messianic Jews Not Expected to Practice Judaism?. I suppose I could be accused of fomenting discord between Jewish and Gentile members of the ekklesia of Messiah, or to put it in more Christian-friendly terms, the members of the “body of Christ”. In the spirit of unity which is aptly expressed during this time of Sukkot, I thought I’d take a different tack. As we discussed last year, the fruit symbolizes the Torah inside a person, while the fragrance represents the Mitzvos, the deeds a person does which affect those around him or her. The four species represent those who have both Torah and good deeds, those who have one but not the other, and even those who have neither. And what are we told to do? We bind them together! Every Jew is a unique and essential part of our nation. Unfortunately, I can’t find this note from Rabbi Yaakov Menken on the Project Genesis website which would allow you to read all of the Rabbi’s comment, but as you might imagine, he is specifically addressing unity among Jewish people and not including non-Jewish believers in Jesus (Yeshua). However, giving Rabbi Menken’s words a “Messianic spin,” I think we can include the entire population within the ekklesia of Messiah, the Jews and the Gentiles, at least for the sake of my example. 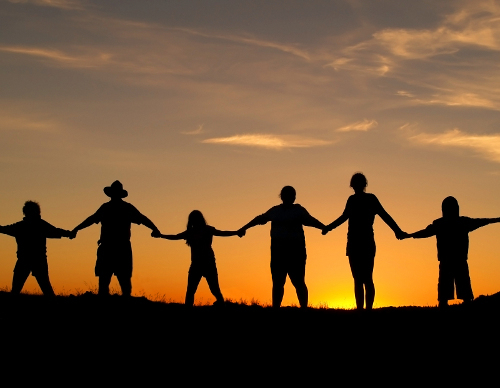 While unity doesn’t require uniformity, we still are united with each other by love of the Moshiach, may he come swiftly and in our day. The Torah tells us to take four species: the Esrog, a citrus fruit with a pleasant taste and smell; the Lulav from a Date Palm which produces fruit but is not fragrant; Hadasim, myrtle branches which are aromatic but does not provide edible fruit; and aravos, from the willow, which has neither taste nor smell. Consider the differences and the distinctions involved in each of the four species. What does a citrus fruit, a lulav, myrtle branches, and aravos from a willow have in common? Those distinctively different objects are required to be bound together and, in essence, to “work together,” in order for Sukkot to be observed properly. 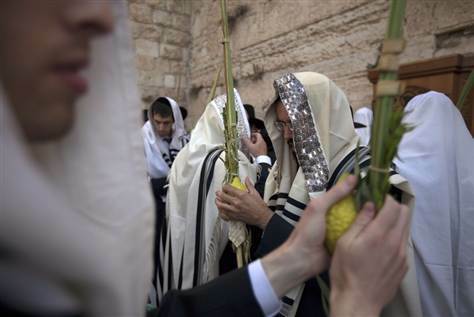 While it’s impossible to offer the appropriate sacrifices related to Sukkot today due to a lack of the Temple and the Priesthood, the celebration is nevertheless observed by religious Jews and not a few believing Gentiles as well. This at least suggests a sort of feast occurring during Sukkot in which we non-Jewish disciples of Christ will join the Jewish disciples in participating in the Sukkot festival with the greatest prophets, priests, and kings in the Bible, all in honor of King Messiah. While I crafted the above quoted-statement to be easier for a traditional Christian to comprehend, I want all of us to understand that Jews and Gentiles will be together at the feast with Abraham, Isaac, and Jacob (and perhaps Moses, Aaron, Joseph, and David) to give glory and honor to King Messiah upon the establishment of his Kingdom. Maybe this will even happen on Sukkot, although of course, I can say that for sure. Certainly the Prophets, Priests, and Kings represented by the Seven Ushpizin guests are not exactly alike, and although they exist within the unity of the Jewish people, they are not identical in type or function. So too it can be said that even though Jew and Gentile in the ekklesia of Messiah and as citizens in the Kingdom of Heaven have unity within that assembly, they also are not identical in type and function. But you won’t see Abraham, Moses, and David arguing about it, so why should we? 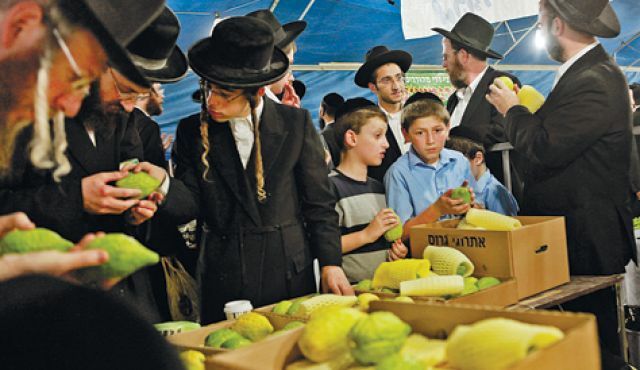 If you are a (non-Jewish) Christian or otherwise are a person who does not observe Sukkot (or who does so in a rather casual manner), you won’t understand the tremendous significance involved in R’ Yitzchak’s generosity. In a sense, he had before him two apparently conflicting mitzvot. He could do as he had done every year and dedicate the more than 300 rubles it had taken him all year to save for the purchase of the most beautiful Esrog he could find in honor of the festival and God, or he could alleviate the sorrow of a Jew even poorer than he was by freely handing over his money for the purchase of a horse, and settle for the plainest Esrog he could still afford. Again, from a Christian point of view (and probably the viewpoint of most people), the decision to help his fellow Jew seems clear, but remember, what is at stake is the honor of both God and of human beings at this Holy time of year. 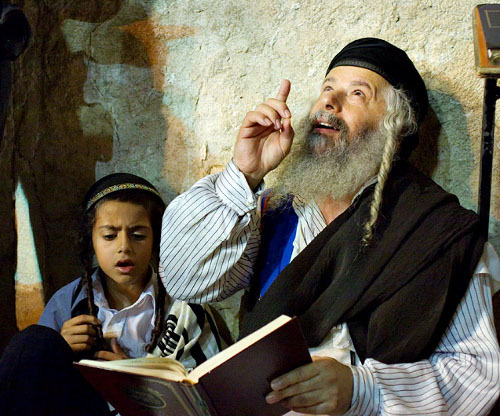 Christians, most other non-Jews, and even some Jewish people often think of the Rabbinic Sages as inflexible, rule-bound, and even “anti-Bible” in considering halachah and Talmud as having any sort of authority when compared to the commandments clearly written in the Bible, but here we see that kindness, mercy, and “waving a horse” for Sukkot are not only original and exceptional ways to perform a mitzvah,” but deserving of special honor as expressing the heart of God. On today’s daf, we find that the Beraisa proposes that were it not for the verse, one might think that honoring parents overrides the Shabbos! The famous Yehudi HaKadosh, zt”l, would deliver a regular Gemara shiur to his students that explored the commentary of Tosfos. One of his students was an extremely talented local boy who was unfortunately orphaned of his father. Once, the Rebbe interrupted their learning so that he could concentrate deeply on a certain subject. His young student knew well that such a break could last an hour or more, so he took advantage of the pause to go home and eat. The boy ate a quick meal and hurried out back to his Rebbe’s home, but his mother called out after him that she wanted him to go up to the attic and bring something down for her. In his rush to return to study, he ignored her call, but half-way back the boy had second thoughts. “Isn’t the whole purpose of study to fulfill the mitzvos? Shouldn’t I honor my mother instead?” he asked himself. So he ran home and did as he was bid. Again, this may not resonate with most people, including many Jews, but we see a comparison between the authority of a Rebbe over his young students and the mitzvah of honoring parents. It is said that a Rebbe is to be considered greater than one’s own father, so you can see that the young student put himself in a bind by going home to eat and then having to decide between his mother’s request and his obligation to promptly return to the Rebbe’s home. In choosing to honor his mother, he not only did the right thing from a human point of view, but he achieved a certain amount of respect from his Rebbe. Did “the spirit of the great Amorah Abaye” really accompany the boy to the Rebbe’s house and answer the Rebbe’s question on the Tosafos he had been pondering? There’s no way to know for sure and probably no way to know if any of these events ever actually occurred. But whether or not they did, there’s a principle being taught here, the same principle as was taught in the previous Rabbinic story. Even if we know nothing of the Torah, the mitzvot, or anything else, we know, or we should know as disciples of Rav Yeshua, our Rebbe, that extending mercy, kindness, compassion, and respect are the greater and loftier mitzvot, the acts of obedience and response to God that, even in moments of doubt, cannot fail. When we finally attend the “feast of Abraham, Isaac, and Jacob,” and it will be a massive affair no doubt, I suppose seating arrangements will be a big problem. What are you going to do with all of the people who show up from all over the world to honor King Messiah and to actually recline at the table with men like Jacob and Joseph? Where should we sit? In retrospect, and considering the example the Master laid out for us, the answer should be obvious. We should consider ourselves as having no honor of our own, but only seek to honor the King and those Seven Ushpizin guests who represent the Prophets, Priests, and Kings of Israel, and indeed, all the Jewish people. If we mistakenly think we are greater than they, won’t our host, Yeshua, be forced to embarrass us by asking us to take the last place at the table? As non-Jewish disciples of the Jewish Messiah King, if we seek to honor him and believe we are worthy of honor, respect, equality, and inclusion within the ekklesia, then both the teachings of the Master and of the great Sages are clear that to be honored, we must honor others, and not deliberately strive to honor ourselves. If our Rebbe and Master did not glorify himself, should we not follow his example? Will he not take the different “species” within the body and unite us, regardless of our extreme differences…or perhaps because of them, and in our honoring him, won’t he honor us? very well said James , from the heart. To me this is true teligion and reflects the heart of God. Thank you gut yontif. Thanks, Robert. I hope all is going well with you. Blessings. On the final day of Sukkot this week, I will most certainly open the door of my house to David, not having a sukkah, and invite him in. I want very much for the Messianic Age to be established. If I can catch a glimpse of that time to come upon the last day of the Feast of Sukkot, and invite my seventh day guest in, along with what his presence means, I may get a semblance of it a little more established in my own home, and while waiting for the real thing to come with Yehoshua, I can have shalom. Thanks. I’am learning here unknown things. God bless you.